Home Concert Review Wake Up Orange County – Adolescents Have Taken the Stage! Wake Up Orange County – Adolescents Have Taken the Stage! Originally out of Fullerton, Ca, Adolescents lived up to their reputation as one of South Orange County’s most coveted punk pioneers last Saturday night. Originated in 1980, Adolescents have been host to members of some of the area’s finest punk bands, including Agent Orange, D.I., and Social Distortion. It seems like Adolescents has someone new on stage with them every time I see them live. Still, each show seems to be better than the last and, even though it’s been 34 years since the band’s debut, the current team of Tony Cadena on vocals (the band’s longest standing member: 1980-1981, 1986-1987, 2001-Present), Steve Soto on bass, vocals, and guitar, and Mike Cambra on drums* is more energetic, fun, and true to the original sound of the band than ever before. After four well received punk acts, each with a dedicated following of their own, Adolescents took the stage to a rowdy, yet welcoming and enthusiastic full house. 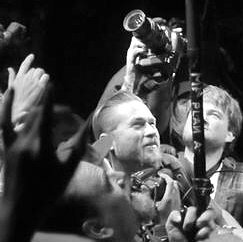 I have noticed a generational clash at punk shows in Orange County over the past few years; with younger fans making their way through the pit without a sense of tradition or etiquette (yes, there is etiquette in a real mosh pit). Most seasoned veterans will agree that many shows end in frustration and the inevitable discussion in the parking lot about the “lame things the kids did tonight”. Not the case last Saturday night. Taking on a large pit, the crowd worked together with one goal at heart, have as much fun as possible while respecting your fellow fans and their right to do the same. The fans are as deserving of a five star review as the band they congregated to party with. The reverence for Adolescence was returned by equal admiration for the fans when Tony Cadena and his band decided to play “Rip it Up” (Adolescents/The Blue Album, 1981) twice… in a row… in reaction to the overwhelming reception of the first performance by the crowd (and a few forgotten lyrics); a definite highlight to an already perfect evening. Another memorable moment was the band’s surprise invitation to a fan (Daniel, at the request of his father) to join the band on stage and participate in an impromptu rendition of “L.A. Girl” (Adolescents/The Blue Album, 1981). The birthday boy killed it, staying true to every note and keeping up with Dan Root on guitar, not an easy thing to do. Throughout the set, the sound was as stellar as the stage show, the fans left stoked, and many little kids, new to the punk scene, were undoubtedly hooked. The band mastered classic Adolescent songs that lent themselves to crowd participation and an air of familiarity including: “Amoeba”, “No Way”, and the heavily requested “Kids of the Black Hole” (Adolescents/The Blue Album, 1981). I know that I applied the classic blue Adolescents sticker on my car first thing the next morning! If you haven’t seen them live, do it immediately; you can’t call yourself punk without an Adolescents show under your black studded belt!